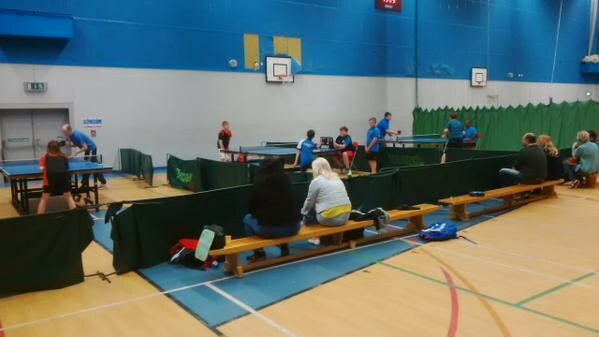 The first round of matches of the new Blaenau Gwent Community League began on Sunday at Abertillery sports Centre. The format of the league consists of six teams of 2 players, where each player participates in 2 singles matches and a doubles match. The league is taking place on Sunday afternoons every fortnight. The Spring league will run from 19th April until 14th June with a league singles tournament organised for the 28th June, where all players who have participated in the league are eligible to enter. We will be hoping to run further league seasons in the near future. On Sunday, there were wins for the Cwmbran Bluebirds, the Cwmbran Vikings and the Abertillery Warriors. The Cwmbran Bluebirds beat the Abertillery Tigers 5-0 to gain the maximum 7 points (1 point is awarded for each individual match win plus 2 bonus points are awarded to the winning team). Matthew Cullingford and Oliver Rogers won both their sings matches and also teamed up to win the doubles match. The Cwmbran Vikings also won their match 5-0 against the Abertillery Dragons to join the Bluebirds at the top of the table on 7 points. Both Matthew Powell and Haydn Skinner won their two singles and also combined to win the doubles match. The Abertillery Warriors got off to a winning start with a close 3-2 victory against the Abertillery Panthers. Warrior's David Blake and Sukavanth both gained victories over Panther's Ioan Edwards and won the crucial doubles match 3-1. Player of the Match was Garin Edwards who won both his singles matches tp pick up two points for the Panthers. So after the first of matches, both Cwmbran teams top the league on 7 points. The next round of matches take place on Sunday 3rd May where the Bluebirds take on the Dragons, the Panthers play the Tigers, and the Vikings and Warriors go head to head. Blaenau Gwent Table Tennis League is a table tennis league affiliated to Wales Membership.